I moved to the house my husband's grandpa lived. The house has a garden. There are a lot weedy. I have decided to try to garden. I will plant flowers, herbs and vegetables. I moved to the house I live now about an year ago. There were a lot of weeds in the garden. I cut them. This year I planted several kinds of herb. For example, lavender, thyme, mint and basil. I hope they are blooming more. 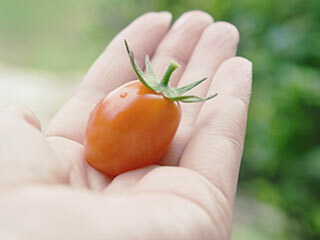 A tomato in my garden looked ripe. And I immediately ate it. A garden bench + An eucalyptus tree…. A bench in my garden. The bench was used by my husband's grandpa. It has been there before we moved to the house. I planted a eucalyptus tree by the bench. A watering can and a bucket in my garden. I am watering the eucalyptus tree with the watering can and bucket every day. The watering can and bucket was used by my husband's grandma. I like them very much, too. 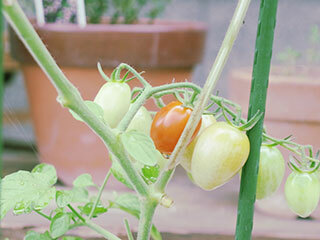 I planted tomatoes in my garden. I noticed green tomatoes when I was watering this morning. I was so glad to see it. I am looking forward to harvesting them.